Suitable for concrete, plastic, fibreglass or flat sided steel tanks. Flanged couplings, also known as wall sleeves, are 100mm DWV PVC fittings used to form penetrations in concrete, plastic, fibreglass or steel tank walls. There are no centre ribs so pipes can penetrate through the coupling into the tank. PVC solvent weld ‘blue glue’ bonds PVC pipes and fittings to the couplings. All styles are suitable for casting into concrete tanks. The external flange secures the coupling in the concrete. Flanged couplings will fix Nobis Products Septic Tank Inlet and Outlet Fittings into septic tanks. The flange is at 90° to the coupling. It is available in 100mm and 50mm widths, which can be trimmed to suit narrower walls. Suitable for flat walled large diameter (>1500mm) plastic or steel tanks. Suitable fasteners and sealer are used to fix the 20mm convex flange to the tank wall to make a watertight tank penetration. Suitable for small diameter tanks. It has a convoluted 20mm flange that fits the wall of a 720mm diameter tank. 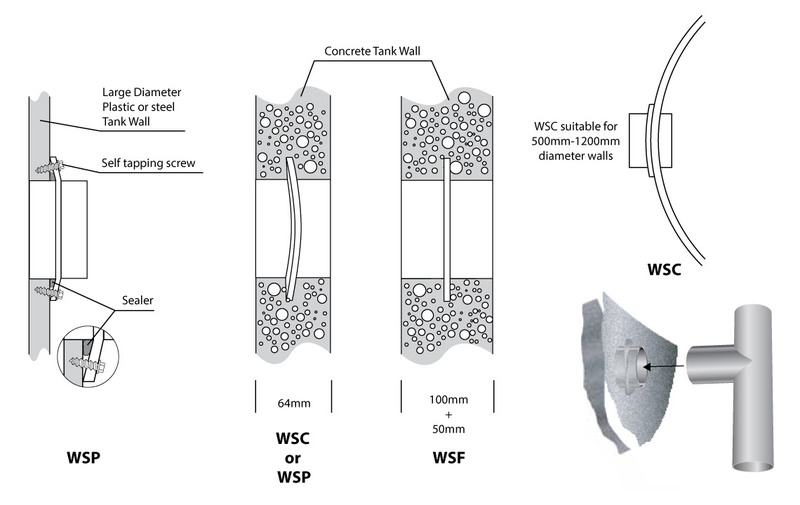 The WSC style is more suitable for 500mm to 1200mm tank diameters than the WSP style. Couplings can be cut down for thinner walls.